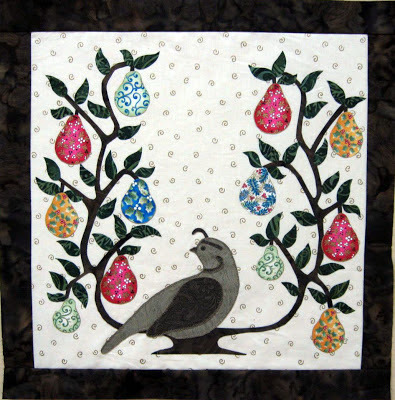 How do you like this festive appliqué quilt block? A Partridge in a Holiday Pear Tree. Marita, the owner of The Quilters Path, a delightful quilt shop in Mt. Juliet, Tennessee, showed me this beautiful quilt block that she made with Blank Quilting's Holiday Pears fabric collection. The pattern is Baltimore Christmas, a Block of the Month (BOM) design by P3 Designs. What a perfect application for this fabric print! The scale is just right and the pears have built-in shading that gives them a 3D look hanging from the branches of the tree. 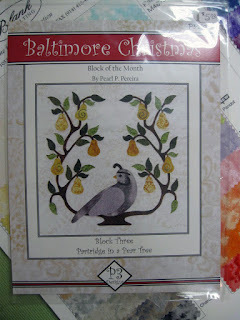 "Baltimore Christmas" appliqué BOM pattern by P3 Designs. Another project that one of Marita's customers made with Holiday Pears is this casserole carrier. She complemented the colorful pear fabric with red, blue and green batik strips and accented the piece with a smart black trim. 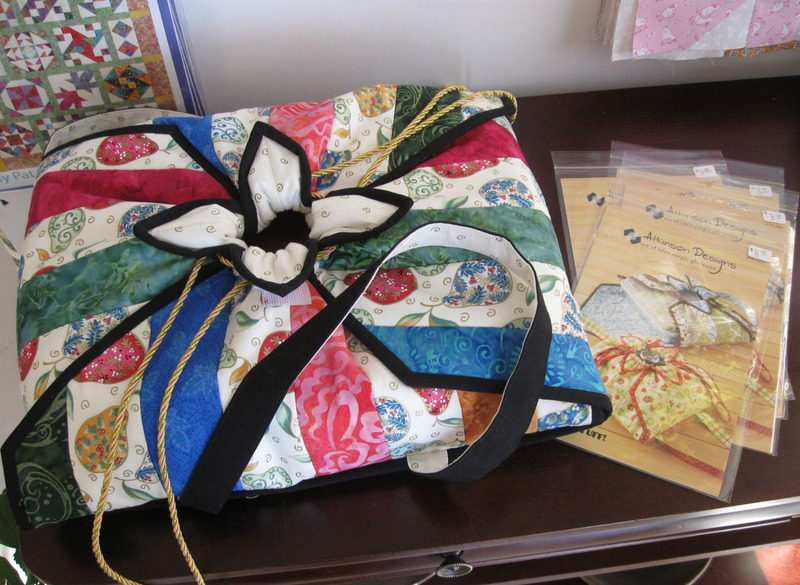 The casserole tote pattern is called "Hot Stuff" by Atkinson Designs and is available at The Quilters Path quilt shop. 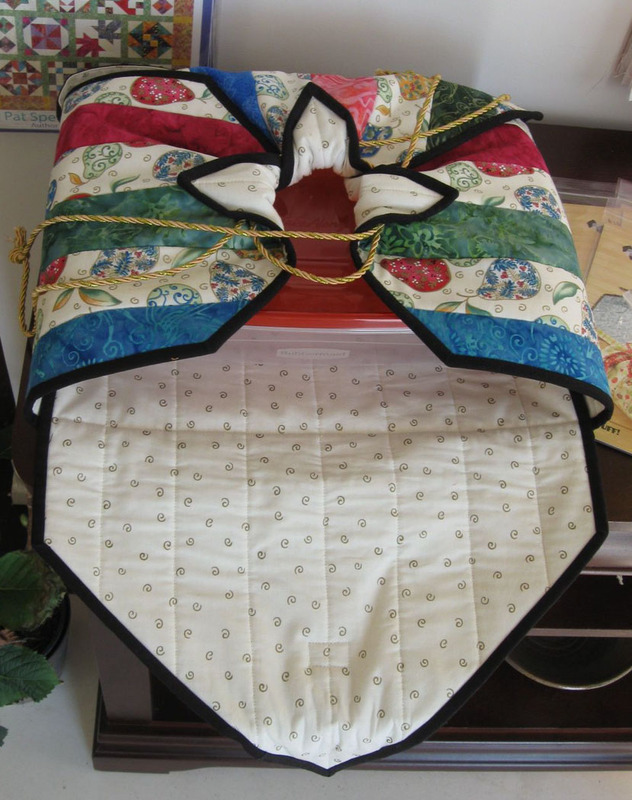 Casserole carrier featuring Holiday Pears fabrics by Blank Quilting. Hot Stuff pattern by Atkinson Designs. Here is a view of the inside of the carrier which can hold a 9" x 13" pan comfortably. Why not take your favorite casserole to the next pot-luck dinner or summer picnic in a stylish carrier like this one? The Holiday Pears fabric collection is not only great for the holidays, but is versatile enough to be used throughout the year. Here is a post from my first visit to The Quilters Path. Marita offers a wonderful selection of quilting fabrics, notions, patterns and programs and the customer service is top notch.